The article below appeared in the Feb 3 issue of Health with Perdana, a regular column in The Star by Perdana University faculty members. This week’s article is contributed by Prof. Srikumar Chakravarthi, Professor of Pathology and Acting Dean at the Perdana University Graduate School of Medicine. One-third of all cancer deaths are preventable and can be attributed to lifestyle choices that we all make every day. Poor diet, lack of physical activity, and consuming alcohol and tobacco are all associated with an increased risk of cancer. Simply changing what and how much we eat can significantly reduce the risk. It is also important to note that a healthy, balanced diet should come from natural and whole foods, not from vitamin supplements. Being overweight or obese has been linked to cancers of almost all the organs in the body, including kidney, pancreas, liver and breast. Given the lethality of some of these cancers, we have to be mindful of our weight and control our caloric intake. Indeed, the most important factor in the relationship between diet and prevention of cancer is healthy weight maintenance throughout life. Weight maintenance can be achieved by balancing caloric intake from food and beverages, with physical activity. Meanwhile, a high intake of processed meat and red meats (beef or pork) may be associated with an increase in stomach and colorectal cancers. Evidence suggests that risk for colon and rectal cancer may increase by 15%-20% for every 100g of red meat or 50g of processed meat per day. Red meat contains compounds such as iron that may cause the formation of free radicals. Processed meats contain nitrates, which have been shown to cause cancer in laboratory animals and are suspected of causing cancer in humans. Carcinogens are also present in certain foods and evidence suggests that eating salt-cured, smoked, pickled or charcoal-broiled foods can increase the risk for cancer. Rates of stomach and oesophageal cancer cases are especially high in parts of the world where food is often prepared using these methods. We should also be mindful of how we cook. A substance called benzopyrene is formed when fat from meat drips on to hot coals during broiling. The rising smoke then deposits this carcinogenic substance on the meat. Antioxidants are compounds present in fruits and vegetables that help protect tissues from being damaged. Tissue damage is linked to increased cancer risk; therefore antioxidants may play a role in cancer prevention. Types of antioxidants include vitamin C (ascorbic acid), vitamin E, and the carotenoids – vitamin A and beta-carotene. Their protective effect is only observed when one consumes antioxidants from plant foods such as fruits and vegetables, and not from supplements. The link between cancer and alcohol is complex because frequent alcohol consumption may result in many health problems. The carcinogenic effect may result from the direct contact of alcohol on the mouth, pharynx and oesophagus. Heavy drinking can result in liver cirrhosis, which may lead to liver cancer. Alcoholics commonly have nutritional deficiencies because alcohol contains only empty calories, and food intake is often compromised. If heavy drinkers also smoke cigarettes, the risk for cancer is compounded. Alcohol is high in calories and low in nutrients. Calories from alcohol can contribute to weight gain, again a risk factor for cancer. The risk factors for cancer act cumulatively to contribute to the occurrence of cancer; they are not necessarily the cause of cancer. 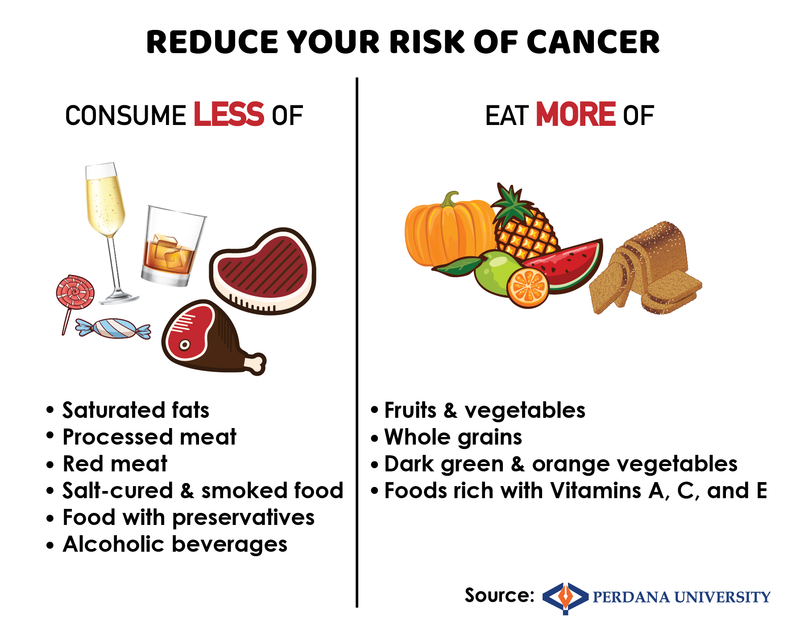 Lifestyle risk factors for cancer are usually preventable and avoiding certain factors may lower one’s risk in developing cancer. Avoid excess weight gain by limiting high caloric foods and beverages, decreasing food portions, limiting high calorie snacks and engaging in regular physical activity.